While most of our buying, selling, and collecting is either clothing or smaller home décor items, we also love furniture of all shapes and sizes. 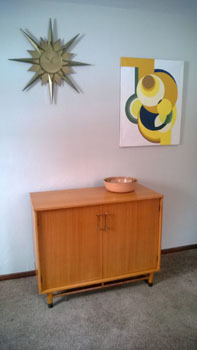 Our home was built in 1946 and we lean towards the 1960s as far as décor goes, although Arlo is truly the mid-mod lover – I have a soft spot for the late 1800s, so we do have some earlier pieces. Our bedroom set is a 1963 Heywood Wakefield set – the Fascination group, in Topaz – and we have a Heywake dining room table and chairs as well. We live in a part of the country that, for whatever reason, hasn’t quite caught on to the midcentury modern trend, so occasionally we find ourselves in the position of being the only folks who recognize the beauty of certain pieces. 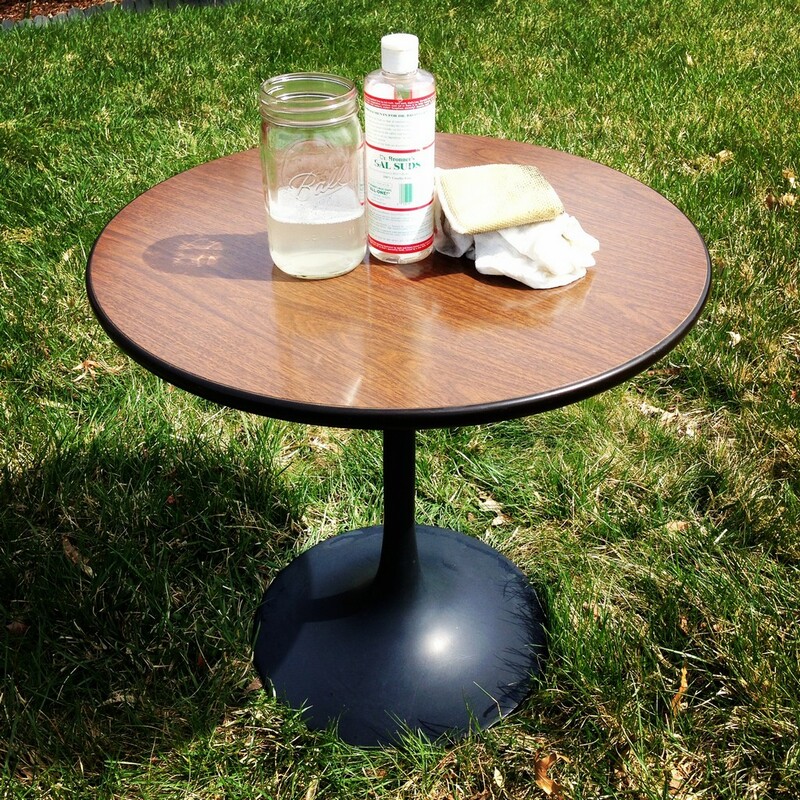 We see a lot of fantastic furniture, and we simply don’t have room for all of it. This happened to us recently when we had to leave a Heywood Wakefield Kohinoor bedroom set behind. And we sadly passed on some great Lane tables the other weekend, too. But sometimes, we see things we just can’t pass up. I mentioned previously how much we love stories – and sometimes the story is so good, we wind up with some extra items in the back of the truck. 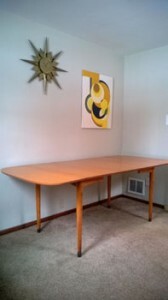 That’s what happened recently with this fantastic Drexel dining room set. We visited a house that was being gutted and remodeled for sale. It was a shame, because it was a classic 1950s suburban home, and we shudder to think how it was going to be modernized. The kitchen was sublime! Some of the original furniture was left, and we struck up a conversation with the past owner’s children about the house and furniture. We were told this Drexel set had been purchased new when their parents married in 1955, and had never been moved. Their daughter remembered sitting under the table as a small child, playing. 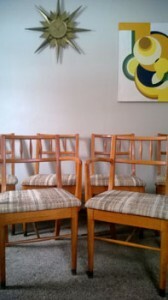 Chairs – so many beautiful chairs. This set is the New Today’s Living line, which we have seen attributed to Milo Baughman. This line was produced in 1955, which, as far as we can tell, is when Baughman was working for the company. 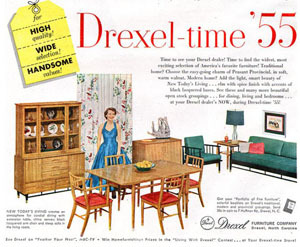 We managed to find some original ad copy, and in Drexel’s original publicity for the line they describe it as having “light, smart beauty” and being “elm with spice finishes”. We just know we saw it, we liked it, and we had to take it home. 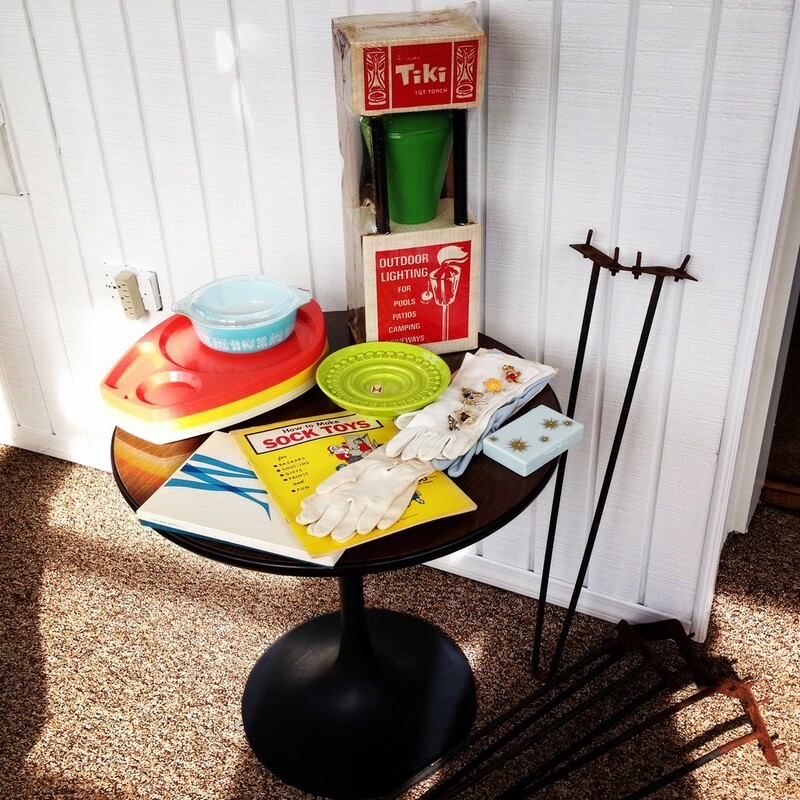 More storage = more room for more vintage goodies! This set includes an extension dining room table with two leaves, 6 chairs (4 mates and 2 captain’s chairs), a sideboard, and a china cabinet. 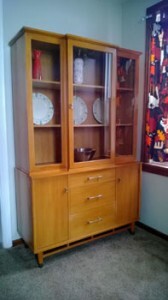 All pieces are in wonderful condition for their age, and are really good examples of midcentury style. However, once we got it home it quickly became clear that we just weren’t going to have room to display it or store it – so we’re going to have to find it a new owner. We live in Pittsburgh, and this would be pickup only, but if you’re interested in this beautiful set please contact us and make us an offer. We want to see it find a good home, it’s such a lovely set with such a great story. See the set here on eBay! 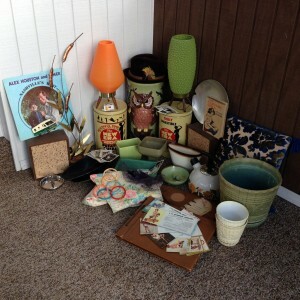 Again – more storage = more room for more vintage goodies! Let’s talk about personal style. I mainly wear vintage dresses and accessories, but I tend to incorporate multiple eras into my look. 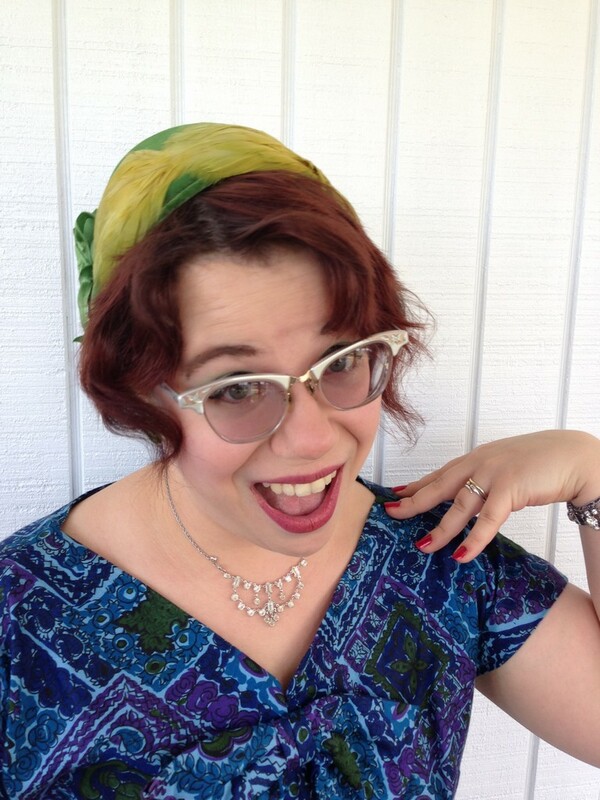 I have no problem wearing 2014 hair with a 1960s dress and my everyday 1950s eyeglasses. My style is much more about color and pattern matching, and I tend to wear what makes me feel good as opposed to being into the period authenticity of the look. I admire and respect people who put the time and energy into perfecting that VLV pin-up perfect vintage style. Learning how to style the hair and makeup is not easy – when ladies would say they couldn’t go out because they had to wash their hair, they meant it. Washing and setting a classic 1940s or 1950s hairstyle is something that can take quite a bit of time and attention, even if you’re in the habit of doing it. The next time you look at an old yearbook, think about all the hours those young ladies spent setting their hair! So in my day to day life, I am much more casual. I don’t usually wear makeup, and you’ll always find me in flats. Yesterday, I tried to clean out my closet. I’m still working on it. Do you know those faux nut containers that are full of spring snakes? I dislodged a wide brim hat and the whole top shelf jumped out at me. There are so many goodies in the world, but never enough space! Many of the items I own I really do tend to view as collectables, and I don’t usually wear them. But standing there looking at all the hats, shoes, scarves, stockings, and petticoats that had fallen down around me I decided that instead of putting them away, I should just put them on. So following a quick wash and set and some hasty makeup, here’s my best vintage look made up of favorites from my collection. The green velvet hat with feathers I got from my friend Becky – it was her mother-in-law’s. Perfect. The glasses are my regular pair – aluminum Art Craft frames. 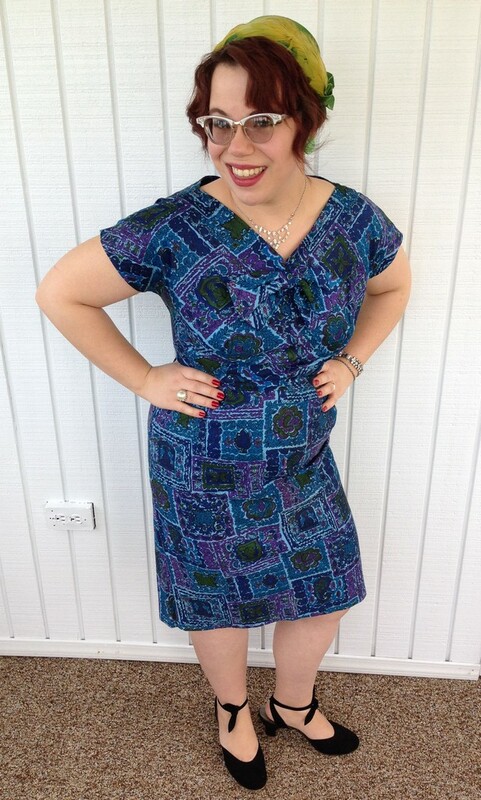 The dress is a handmade cotton with a great novelty pattern featuring Buddhas. I love wild patterns and extravagant necklines – this one has a big sassy bow. I have another dress in a different cut made of the same fabric in a different shade, also handmade, though by someone else. Amazing. The shoes are a pair of 1940s Arthur Murray dancing shoes – size 10! I bought these from a woman who had lost her mother, the original owner of the shoes. She sent me a handwritten letter telling me of the fun her mother had wearing them dancing, and asking me to take care of them. They’re very special to me, I love hearing about people’s personal connections to particular items. They’re beautiful shoes! I rarely dress up, but when I do it is always a pleasure to take off the heels, wash off the makeup, and become myself again. I’m much more comfortable. But it was an important reminder to appreciate the things we do have in our collections – I really have to wear more of these hats! I’m going to go finish cleaning my closet, and rotate my wardrobe while I’m at it. Here’s to enjoying what we have, wearing what we love, and occasionally taking the time to set our hair. 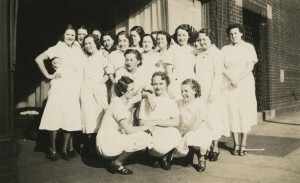 Thelma Evey, front and center, with a bevy of beauties behind her. At my day job, I am a librarian and archivist who is lucky enough to handle my library’s photo collection. It has been a great experience for me, and I’ve learned so much about photographs over the years. I’ve always loved photos, and have picked up quite a personal collection. Once you start collecting photos, though, you have to quickly narrow your focus, since there are so many abandoned images of other people’s lives floating around out there. I have two main types of photos that I collect – pretty ladies, and people having fun. Obviously, then, my favorite types of photos are pretty ladies having fun! You can imagine my pleasure when I was at a sale the other weekend and found an entire album containing roughly 100 photos from the 1930s and 40s – many of them of young, pretty ladies having fun! I love their hair, my goodness. And it makes sense this group of girls has excellent hair because they’re posed outside of a beauty school – they are all students, including the woman in the front center of this photo. 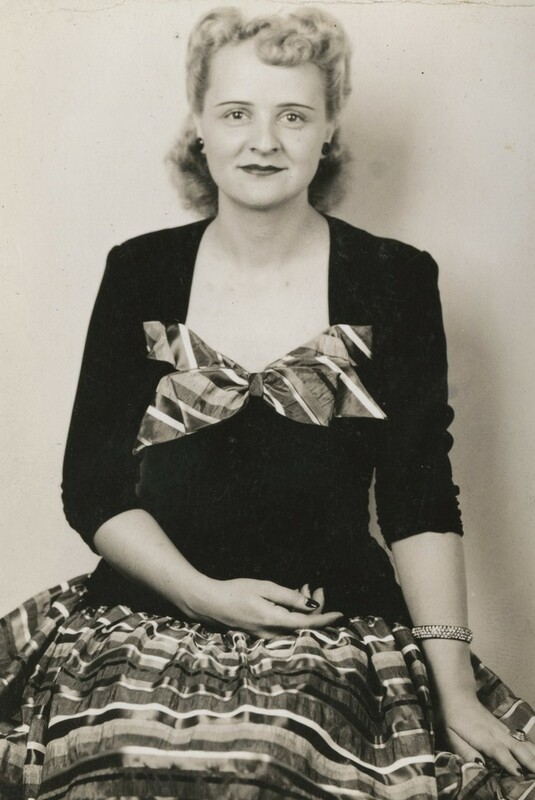 Her name was Thelma Evey, and I brought all of her photos home. A later photograph of Thelma Evey. What a looker! After beauty school Thelma seems to have had a close relationship with the same group of ladies that appear several times throughout the album. They may be sisters, or just BFFs – but they had a great time together. There’s photos of them sunbathing, having porch parties, and standing in the California sun, 1945, with some handsome sailor boys. Eventually you see Thelma appearing with, we’ll assume, her husband and children. There are a few photos from the 1950s in the album, and then it’s over and we’re left to wonder what may have happened since then. However, we know she was pretty, and she sure appears to have had fun! There was one photo in particular that caught my attention when I was going through the album. 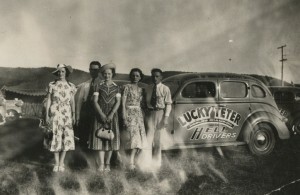 It’s a photo of Thelma and her friends standing in front of a car with the words “Lucky Teter World’s Champion and his Hell Drivers”. Woah. Hell Drivers? Now that sounds pretty cool. So I dug into solving the mystery of who Lucky Teter might have been, and what the heck is a Hell Driver, exactly? In this day and age I was able to give it a Google – and I quickly lost a lot of time reading about a fellow who seems to have been a pretty big influence in American car culture – and doesn’t even have his own Wikipedia page! 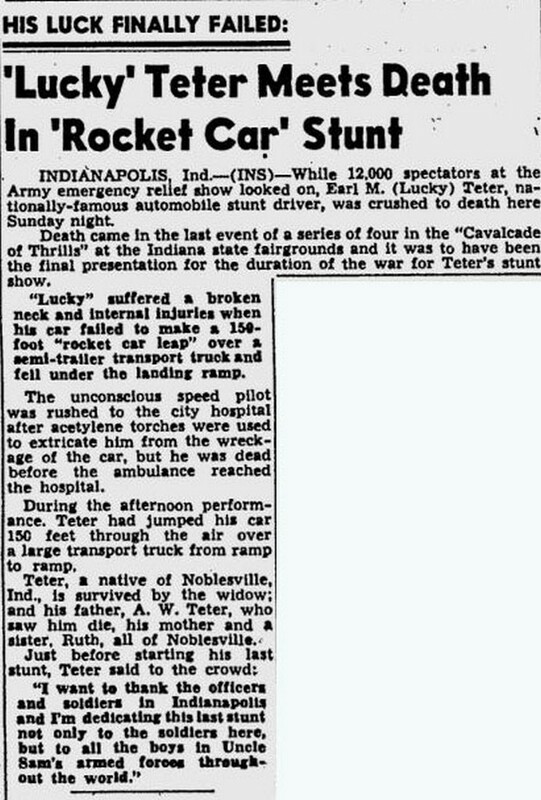 Here, briefly, is the story of Lucky Teter. 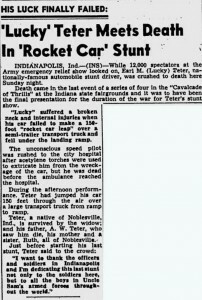 Born Earl Teter in Indiana, he began doing automobile stunts at county fairs in the early 1930s, traveling throughout the United States and even to Cuba with his group of stunt drivers. Lucky drove both cars and motorcycles, and shocked audiences with his stunts that included intentional crashes, jumps using ramps, jumps over buses, and jumps through fire. Lucky was very successful and earned quite a bit of money as a touring daredevil. 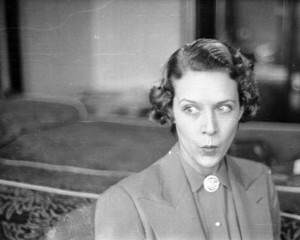 Mrs. Teter listens in as Lucky performs at an event in Georgia, 1938. I’d make that face too! Image courtesy of Georgia State University Library. It was a pleasure to learn about Lucky. He seems like a very American sort of fellow – he did what he wanted, lived how he pleased, and had a smile on his face while he did it. I bet Thelma Evey and her buddies really enjoyed the show. Trial By Torture – Watch Lucky do stunts in a Chrysler promotional video! 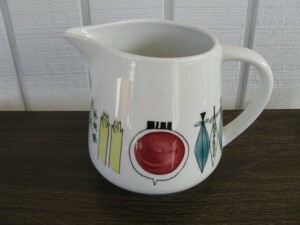 I’ve been adding some great items to the shop this week, including this pitcher by Rorstrand, Sweden. This was designed by Marianne Westman in 1954. The pattern, called Picknick, has been reproduced on everything from fabric to framed prints. We know someone is going to love this classic example of midcentury design. I also added a painting to the shop, which is a first for us. 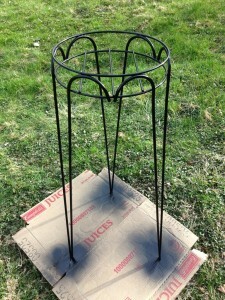 We love mass produced items, sure, but who can resist a one of a kind art piece? We bought this from the estate of the anonymous artist. There were lots of portraits available, but we selected this one because we just loved this young lady’s retro charm. The background is a wonderful rusty orange color. 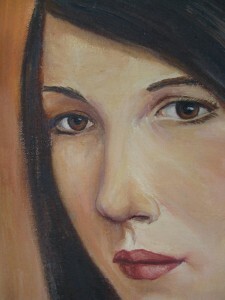 You can find more photos of this original painting in our shop here. 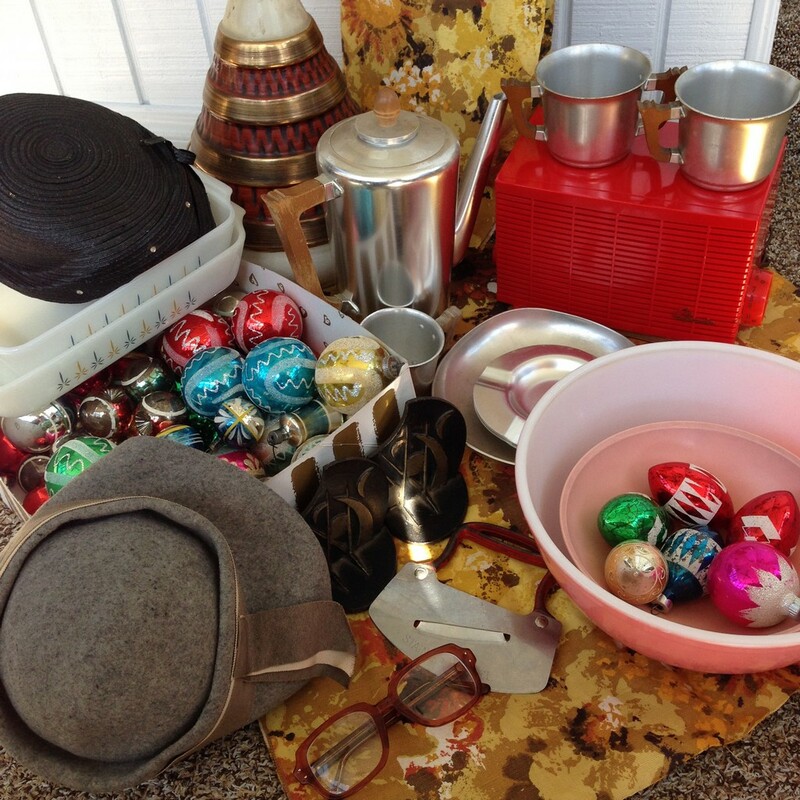 We will be adding quite a few great items to our shop in the coming weeks, including some fab fabric, more home decor, some bright spring dresses, and 1960s ladies accessories. Follow us on social media to see our finds first! A lot of the time in vintage fashion, men’s clothes are overlooked. As a longtime wearer of everything vintage, from Van Heusen dress shirts to hippie tunics, I’m pleased to have a chance to change that. 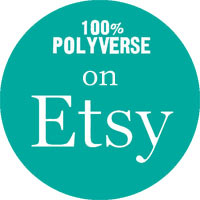 I’m Arlo, one half of the Polyverse team, and I’d like to focus on some of the men’s clothing we have in our shop. In the spirit of finally getting some warmer weather around here, let’s take a moment to talk about the Aloha shirt, better known as the Hawaiian shirt. Hawaiian shirts have gotten a reputation as the classic party apparel, and why not. They’re bright, comfortable, and you’re never going to see one tucked in. There’s a little more to their story, though. Aloha shirts as we know them started to be produced around the 1930s, and were based on traditional patterns and fabrics that had been popular in the islands for hundreds of years. Modern designers began incorporating these patterns, fusing traditional style and Western sensibilities. Air travel made the islands more accessible, and by the time Hawaii became a state in 1959, Aloha shirts were reaching the height of their popularity. Throw Elvis into the mix, who popularized the islands in films like 1961’s Blue Hawaii, and you’ve got the coolest shirt around! 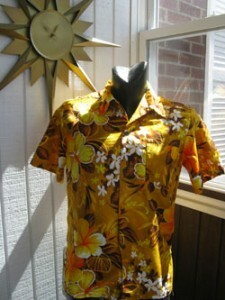 Aloha shirts remained popular throughout the rest of the 20th century, so you’ll see examples from the 1930s to the present. 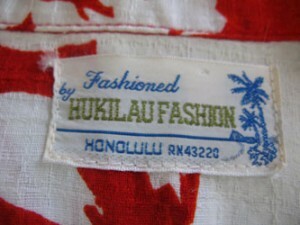 A glance at shirt labels will help you to know when you’ve found a vintage Aloha. I love vintage labels. They’re always the first thing to look at when you’re shopping. So unique, and like the shirts, so colorful. 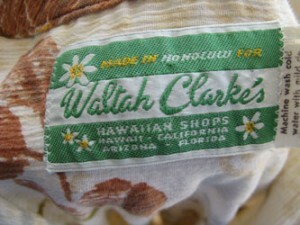 We’ve got three vintage Hawaiian shirts for sale in our shop right now, and they’re all great. 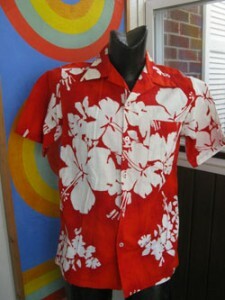 A red shirt by Hukilau is a great example of an Aloha shirt from the 1960s, made for tourists visiting Honolulu. It has the classic look, and a wonderful bright red color that will certainly make you the life of the party. This shirt is 100% cotton – shirts from the 1940s and 1950s tended to be made of early synthetics like Rayon, which helps to tip us off that this one is a slightly later model. The second Aloha shirt I’d like to feature is slightly more subdued. This one also isn’t a classic Western-style button down shirt – it’s a polo shirt in brown with a light floral print and a chest pocket. This was made by Waltah Clarke, who sold shirts in Hawaii but also exported shirts to the mainland. The style had become so popular that people wanted the spirit of the islands without having to make the trip. 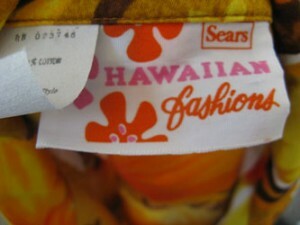 The final shirt I’m going to look at is another 100% cotton Aloha shirt – but this one is by Sears Fashions. You might not associate a traditional American company like Sears with the Aloha print, but the fact that these shirts were produced and reproduced in such large numbers really shows how infatuated the American public was with the Aloha shirt. In the beginning of this post, I talked about how men’s clothing is sometimes overlooked in vintage fashion. 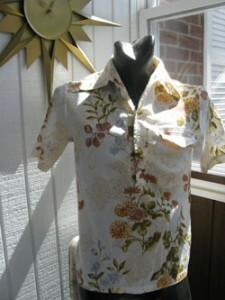 But the Aloha shirt is a men’s vintage style that certainly can’t be ignored. If you like the looks of any of these shirts, stop by our store and pick one up. We’ll add more as we get them, so keep checking back! If you’d like to learn more about Aloha shirts, check out The Aloha Shirt: Spirit of the Islands by Dale Hope. Since I’m also a librarian, I feel it’s my duty to remind you to look for it at your local library!